There is so much racist history that is not acknowledged and accounted for. I know this to be the case from my own education, and I know there is so much more for me to learn. 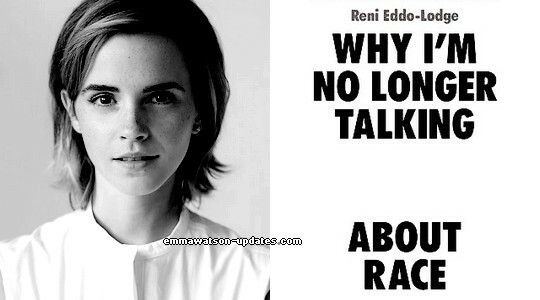 This is why I’m excited to announce that our first book of 2018 is Why I’m No Longer Talking to White People About Race by Reni Eddo-Lodge which talks about the history of racism in Britain. I am not supposed to have favourites, however this was the most important book for me this year. When I gave my UN speech in 2015, so much of what I said was about the idea that “being a feminist is simple!” Easy! No problem! I have since learned that being a feminist is more than a single choice or decision. It’s an interrogation of self. Every time I think I’ve peeled all the layers, there’s another layer to peel. But, I also understand that the most difficult journeys are often the most worthwhile. And that this process cannot be done at anyone else’s pace or speed. It would have been more useful to spend the time asking myself questions like: What are the ways I have benefited from being white? In what ways do I support and uphold a system that is structurally racist? There seemed to be a million types of feminist and feminism. But instead of seeing this as a splintering, I could have asked whether this defining was actually empowering and bringing about better understanding. But I didn’t know to ask these questions. I met a woman this year named Happy who works for an organization called Mama Cash and she told me this about her long history working in the women’s sector: “Call me out. But if you’re going to call me out, walk alongside me as I do the work”. Working alongside women like Happy is a privilege. As human beings, as friends, as family members, as partners, we all have blind spots; we need people that love us to call us out and then walk with us while we do the work. This has been an amazing two years for me, working on Our Shared Shelf. There were moments when I wondered whether the club should be an ongoing thing. Thank you for making me sure that it would be crazy not to keep going in 2018. Thank you to everyone who has contributed, laid themselves bare, been patient and compassionate or shared useful information with other members of the community. Thanks to those who hid books and posted their photos to Instagram, or started a talking circle or smaller club and met up in different parts of the world. Everyone has their own journey, and it may not always be easy, but what I can promise is that you’ll meet some extremely cool people that you will REALLY love and respect along the way that will walk this path with you. You’re not alone. And even if you are, in a particular moment...remember you come from a long line of feminists who did this work, in the outside world but also inside themselves. I hope this book, as we move into 2018, empowers and inspires you as much as it has me. I am looking forward to discussing the contents of Reni’s book in more detail with you soon.